There are several reasons that a will may prove invalid. It is important for testators to be aware of these pitfalls in order to avoid them. 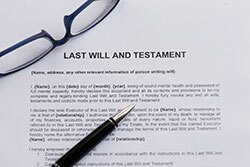 The requirements vary from state to state, but most states require a valid will to be witnessed by two people not named in the will. Some jurisdictions require the document to be notarized as well. Although these restrictions may be relaxed if the will is holographic (handwritten), it is best to satisfy these requirements to ensure that the testamentary document will be honored by the probate court. Anyone over the age of 18 is presumed to understand what a will is. At the end of life, individuals are often not in the best state of mind. If court finds that an individual is suffering from dementia, is under the influence of drugs or alcohol, or is incapable of understanding the document being executed for some other reason, the court may invalidate the will on the grounds that the individual does not have testamentary capacity. Whenever an individual writes a new will, it invalidates all wills made previously. This means that a will might be believed to be valid for months until a more recently executed document surfaces. The newest will always takes precedence, controlling how assets should be distributed. Every will is required to contain certain provisions to carry out its purpose. These provisions, ensure that the testator understands the reason for executing the document. Although these provisions vary from state to state, some are common to all jurisdictions. It should be clear that the document is intended to be a will. The document should demonstrate an individual’s wishes in regard to what should happen to his or her property after death. A proper will should also include a provision to appoint an executor to act as an agent for the estate and enforce the terms of the will. If the document lacks any of these provisions, the will may be declared invalid. A will that was executed under undue influence, coercion or fraud will be invalidated by a court. If a will has been presented to a testator for a signature as if it were any other document, like a power of attorney or a business contract, the court will find that the will was fraudulently obtained and will not honor it. If an individual providing end of life care with exclusive access to the testator threatens to stop care unless a will is modified, that modification is considered to be the result of undue influence and the court will not accept it.